A new breed of hazelnut, developed at OSU, has just been released. Called “Wepster,” it’s the result of more than a decade of breeding and has characteristics that make it especially commercially productive. 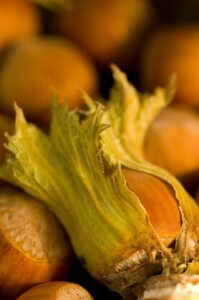 Meant to replace the Lewis, Clark, Sacajawea, and Yamhill varieties, Wepster nuts are smaller and rounder than most other hazelnuts, making it a superior match for the baking and chocolate industries; its tree requires less upkeep than other common breeds, and its height makes it compatible with harvesting machinery. The breed is also very resistant to eastern filbert blight, a fungal disease common throughout the Willamette Valley, where almost all of the USA’s hazelnuts are grown. Wepster nuts have one of the highest kernel weights of other breeds, and even mature slightly more quickly, allowing for an earlier harvest than varieties such as Barcelona. Combine that with a competitive nut yield (studies show it producing 43-57 pounds of nuts per five years, at the very least matching the Yamhill variety), and it offers a consistency that tops other breeds. Not to mention it has a solid immunity to big bud mites, another productivity-zapping pest, and its pellicle is easily—and entirely—removed with dry heat. Developed under the hand of Shawn Mehlenbacher, OSU’s hazelnut breeder, and named after the Wepster family who helped found the Oregon Hazelnut Industry Endowed Professorship, Wepster trees are expected to begin selling to growers later this spring.